GUTHRIE, Okla. – It’s been a few years since Jake Barnes last won a team roping world championship. It’s OK. He owns seven heading gold buckles, the last of which came two decades ago. He is still one of the greatest ropers on the rodeo trail. 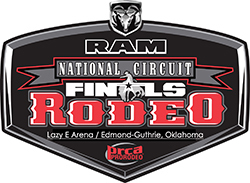 Proof of that is in the 25 qualifications to the Wrangler National Finals Rodeo, but one also could point to the four championships at the Ram National Circuit Finials Rodeo. He leads an amazing list of top-name team ropers who will be part of ProRodeo’s National Championship, scheduled for 11 a.m. and 7:30 p.m. Thursday, April 10; 7:30 p.m. Friday, April 11; and 1 and 7:30 p.m. Saturday, April 12, at the Lazy E Arena. He’ll be joined by headers Brandon Beers, Ty Blasingame, Nick Sartain, Colby Lovell, Justin Davis and Dustin Bird; the top heelers are Jim Ross Cooper, Travis Graves, Ryan Motes and Cory Petska. There are dozens of NFR qualifications among that crew and a few gold buckles. But that’s what fans have come to expect in central Oklahoma each spring when the top contestants in the game battle for that elusive National Title.